Look at this soup. Looks pretty innocent, doesn't it? Just sitting there, in a bowl, some nice buttered bread on the side, sitting on a little square lap tray just waiting to be gobbled up. It is THE DEVIL'S OWN SOUP. We've all made mistakes while improvising recipes - how else do you end up with perfection? But my attempt at a groundbreaking new butternut squash and ginger soup went down so many horrendous avenues that I had to share it with you in the hope that you might have made an improv error along the way, and we could all hold each other and sob quietly. Let me know in the comments. 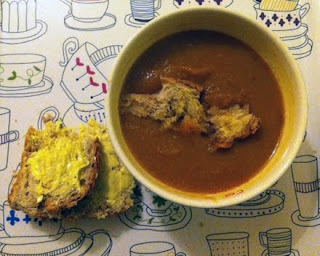 And only ever make Laura's amazing butternut squash soup recipe in future. It started with my internet grocery shop. For God knows what reason, I came out of that with a kilo each of onions and fresh root ginger. You what now? Ginger doesn't last long enough, so I roasted up the two butternut squash I'd bought and set about chopping onions...oh, and some celery, because I'd bought loads of that. Oh, and some carrots, because see the last reason. And, um, six cloves of garlic that my friend Polly had brought me back from the south of France because why use two cloves when you have enough garlic to kill Dracula? All the recipes I'd read said to add anywhere between 2 to 6 teaspoons of grated ginger. I put in 200g. "It's delicious and healthy!" I enthused, "More ginger can only be good ginger!" By the time I'd added my chicken stock, cooked, and then blended it, I had ended up with an absolutely unholy butternut squash and ginger soup. The ginger had overpowered everything else to the extent that all I could taste was that bit-wrong kick you get when you've just eaten a massive piece thinking it was chicken. So, then I set about trying to rescue it. Lea and Perrins can tame pretty much anything. It could not tame this soup. Don't ask why. I think I thought the flavour would balance - no. I have literally nothing for you. After all this, the soup was at least edible, but that bit-wrong mouthpunch from the ginger remains. To top it all off, I forgot to take it to work for my lunch, meaning I will now have to eat it for breakfast and dinner instead. This is awful. So, tell me, while you browse through our archives of tried-and-tested perfect soup recipes: how have you tried to rescue a calamitous bit of cooking? Did it work? Did it make you stronger? Should I have added an orange? Oh lord, you poor thing! I burnt an entire sunday roast (vegetables, meat juices for the gravy - the lot) a few weeks back and decided to 'fix' it by throwing extra red wine at the gravy. Much like you fix, it didn't kill the over-powering taste (of charcoal) but at least made it edible! I have been there on many occasions - being an experimental cook one only realises the need for recipes at moments such as this... Your tom yam idea is inspired though - how about watering it down with some coconut milk too? Or is that just throwing good ingredients after bad...? So ... the conclusion drawn from this is: Lime solves everything? Too much ginger has happened to me a few times, it's easy to underestimate the power of such an innocuous-looking root! My stand-out worst experience was trying to rescue gram flour cookies with chocolate (instead of binning them while I had the chance), the result will forever be known as "sausage biscuits". I can offer no advice as regards this soup, but in general I believe you can freeze root ginger so maybe that'd be the way to deal with a surplus in future. Also, I have a recipe for ginger cupcakes from Martha Stewart that calls for 9oz of ginger, which would be 250g or so anyway (that somehow ends up not overpowering but delicious. No idea how!). So that's also an option if you over-buy in future. Freezing root ginger! Helen, this is why you are my culinary goddess! I actually bought it to make tom yam with, then the supermarket didn't bring me any chicken and that's when the bad began to happen. Wail. Loving the stories so far. I feel marginally less awful. And craving a proper sausage. You can get grated ginger frozen into icecube-sized pieces, so you can dip them straight in from frozen without risk to fingers! Can remember the brand, but ASDA stocks it, along with frozen chapattis etc. (sorry) ...put in the freezer, then peel the dollops off the paper & put them in a freezer bag once frozen. This is incredibly helpful, thank you all so much! I'm going to chuck a head-sized portion of ginger in there when I get home tonight. Ha! WELCOME TO MY WORLD. I tried making a carrot and lentil soup once but didn't have anything other than green lentils. It turned out really quite vile so I added ginger, chilli and garlic in an attempt to make it a sort of dhal. I ended up with hot khaki wallpaper paste. Forever known as 'Camouflage soup'. I did eat a cupcake at a friends house that had been made with the cheapest, nastiest margarine and sweetener instead of sugar and i had to do the whole "mmm, lovely" face whilst gagging inside. I may be on a diet but when i'm cooking for others its President non salted and the full monty, straight to your thighs, unrefined caster sugar. oh and cheesecake with slightly off cream cheese - yeah. not good. I made some Nigella kind of BBQ inspired chilli or something. It required a nip of bourbon. I didn't have any and was living in Singapore where booze costs a bomb. So instead of just leaving it out I used a big slosh of Glenmorangie from the back of the cupboard. whiskey/whisky: same diff right? Never ever ever EVER do this, it was mingin. An over helpful friend was insistent in being useful as I finished off a beautiful boeuf Bourginon which had been cooking for hours for our supper. I suggested that she could just grind a little black pepper for me - seemed a simple enough job (I hate helpful friends in the kitchen, but don't want to appear too rude too often!). The top came off the grinder and my lovely stew was literally peppered with whole peppercorns as they tumbled in. I had to pick them all out....All wasn't actually ruined, but we did get some fiery mouthfuls! This reminds me of the first meal I cooked for my other half - peppered steak in red wine sauce. In my attempt to salt the sauce, the top came off the grinder and large amounts of salt crystals fell in it which I frantically tried to fish out with little success. I tell everyone this is why I don't cook for him, and it's partly true - I can feed myself perfectly well but when I have to cook for others it's just too much pressure! This puts me in mind of the 'duck in the hole' that my late mother-in-law (god rest her soul!) created for us from the leftovers of our Christmas dinner. We had bought an eye-wateringly expensive duck and cooked it al la Delia with prunes and armagnac for the main event - lovely. But come Boxing Day MIL wanted us to have a rest and offered to cook. Thus emerged from the kitchen all the ingredients from the previous day's roast encased in yorkshire pud batter. It was ghastly. Luckily she wasn't too precious and we were able to laugh about it. That dish still haunts me. Agree with everyone else who suggested freezing ginger – for some reason it seems to grate better when frozen too! As for cooking disasters I've had way too many – the first time I ever made soup at uni I put in way too many oxo cubes and basically had to eat veg stock for a week. More recently I made coleslaw for a friend's bbq that tasted like pure onion – no matter how much of every single other ingredient I added (yoghurt, mayo, creme fresh, lemon, sugar and more) I just couldn't get rid of that horrible spikey taste! After your recent musings on popcorn, it's become my go-to snack. Garam masala popcorn, yum. Cinnamon sugar popcorn, great. But my favorite was caramel with mixed spice. But then I ran out of mixed spice... weeell, chinese 5 spice is pretty similar right? ...I mean, sure, it's a bit more savoury, but savoury and sweet works together, right? Like salty-sweet popcorn? NO. Not this one. 5 spice has garlic in. Salt and sweet, sure thing, but garlic and caramel will never, ever be friends. On the bright side - hurrah for popcorn as the perfect snack (so is). Actually, there is no downside. This is hilarious. I'm feeling slightly smug as the worst thing I've done was overcoat the steak and kidney in flour then in sufficiently brown it... Tasted fine but was slightly grey... Never mind, I was the only one eating it!! All of these stories have made me cackle. My husband, when we were students, decided to whistle up a shepherds pie at about 11pm at night when all the shops were closed. He thought he had all of the bog standard basic ingredients in the cupboard, went to add chopped tomatoes (we both like them in pie) only to find we were completely out. Improvising in the good student way he whacked in two tins of baked beans, reasoning that the tomato flavouring would have the same effect. I have never tasted anything quite like it and do not want to again. Moral of the story. Baked beans are not an appropriate substitute for tinned tomatoes. My dear husband made sausage korma once. It was so minging, I wouldn't even try it. And I'd tried his chicken jalfrezi pasta bake. He is now banned from fusion cooking. On a separate note, raw tomatoes stirred through cool spicy food down. hahahahaha, it hurts to laugh. I feel so much better now. I think I shall go and have a "slightly caramelised but nowhere near carboniferous" meringue to make myself feel better. Heh. This is still funny.